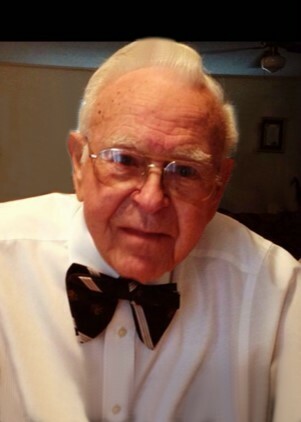 Dennis Dalton Pruitt, 96, of North Little Rock, Arkansas went to be with the Lord March 24, 2019. He was born July 20, 1922 in Antioch, Arkansas to Rev. John R. and Sally Pruitt. Dennis retired after thirty-five years of service from the U.S. Army Corp. of Engineers. A disabled veteran of WWII, Dennis served in the Coast Guard in the South Pacific, working as a ship’s cook. He was a member of Central Baptist Church in North Little Rock for over sixty years. Dennis loved playing music and entertained for the assisted living center where he was a resident for the past five years. He was a master craftsman and enjoyed fishing and cooking, especially coconut cake and banana pudding. He is survived by his son Kenneth Craig Pruitt of Allen, Texas; six grandchildren; eleven great grandchildren; two brothers, Hulon T. Pruitt of Benton and Hollis G. Pruitt of Little Rock; one sister Pearlene Kitts of Searcy; and numerous nieces and nephews. Dennis was preceded in death by his wife Martha Ella Harrison Pruitt of sixty years; his second wife Melma Mash Weir Pruitt; one daughter, Janice Marie McAnally; brothers Arlis and Horace Pruitt; and one sister Geraldine Howanietz.